Thelma welds farm equipment in her own shop with her own equipment. You've heard about Rosie the Riveter. Rosie now has her own organization. Thelma Baldock belongs to Rosie's group of women riveters that served in World War II, but Thelma didn't rivet. She welded. She doesn't know of an organization for welders like her, so she sticks with Rosie. Thelma is 92 years old and remembers her days at St. John's Shipyard in Oregon, welding tanker ships for World War II soldiers, but she's not able to make use of her left leg, arm, or hand. She is a stroke victim. But her stories are intact. Before graduating from high school in Delphos, Kansas, Thelma decided to get away from home. She wanted an adventure. She married and went to Oregon in 1941 to weld ships. She accomplished both goals--get away from home and live an adventure. Training lasted two weeks. She learned how to weld horizontal structures, vertical seams, but not overhead beads. Her first assignment was to attach a U-shaped piece of metal to an upper part of a tanker ship. She told her boss she had not been trained to do overheads. He said she was good at the other types of welding; she could figure out overheads. She tugged on her leather gloves, pulled on a welding helmet, and peered out its glass shade. With shaking hands and a prayer on her lips, she completed the weld. It held. Affirmed and confident, she continued the hard work, knowing that she was making a contribution to the war effort. With every ship completed, she wondered if some of her friends from Delphos would be transported on one she helped build. She would never know. She rotated in and out of night shifts, cared for her young children, and lived in an abandoned train car, complete with bed bugs. After two years, she said, "No more." Thelma boarded a train with her two children and returned to Delphos. Within a few days, she was welding farm equipment for friends and neighbors. In 1955, she married a returned veteran who lived on his family's homesteaded land. 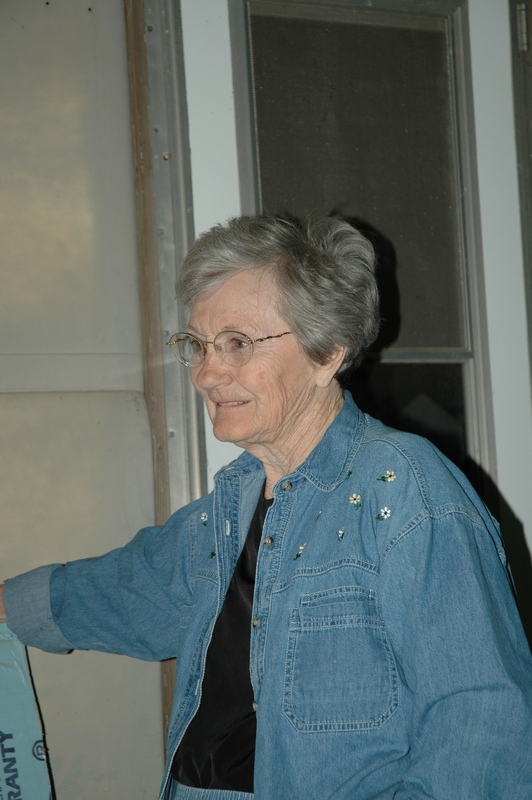 Thelma drove grain trucks, cared for cattle, and welded their farm equipment. She was still welding when I met her ten years ago, and she still looked for adventures. She learned to hunt, bringing in deer and wild turkeys for winter eating. She won trap shoots, stacking up the trophies. She learned to fly the family airplane, and she wrote and sold a cookbook of her own recipes. Bound to a wheelchair now, she continues to think about her past escapades and talks about adventures she'd take on if she were able. Thelma represents the 1940s spirit that united our country, and we are grateful to her and the many others that filled the gaps when men went overseas to fight the war first hand. Thank you, Thelma. Thelma without her welding gear. P.S. At first, women didn't know if they could do men's work. But they learned to drive taxis, run jackhammers, tend water and fire for steam locomotives, and climb high scaffolding to place rivets. Others worked in logging camps, on the railroads, in steel plants, and on farms. A woman worker at an aircraft plant said, "[This was] the first time in my life that I had the chance to prove that I could do something, and I did it." P.S.S. Women gained attention doing men's work. Norman Rockwell drew a woman he called Rosie for the May 29, 1943, cover of the Saturday Evening Post. She became known as Rosie the Riveter.